Anthony Crolla will consider moving up to Ricky Burns' weight class to pursue "big fights" following his rematch defeat by Jorge Linares on Saturday. After the WBA lightweight title defeat to Venezuelan Linares, promoter Eddie Hearn raised the prospect of Crolla moving to light-welterweight. "With the notice I'd certainly grow into that," said Crolla, 30. A move up opens the prospect of facing the winner of Scot Burns' unification bout with Julius Indongo on 15 April. Crolla added: "Physically I feel strong. I was as big as Linares in there tonight." Hearn said: "Ricky Burns could unify the division on 15 April. I wouldn't rule out the option of moving up to fight the winner." Crolla weighed in at a fraction under the 135lbs lightweight limit before his meeting with Linares, so a move to the 140lbs division looks physically within reach. Scotland's Burns has also made similar weight jumps, winning a world title at super-featherweight, moving on to do the same at lightweight and he now holds the WBA crown at light-welterweight. Indongo holds the IBF strap, while highly-rated American Terence Crawford - undefeated in 30 fights - holds the division's other titles. Sporting stitches above his left eye, Crolla told reporters that in the third round against Linares, he had aggravated a rib injury picked up in training, with trainer Joe Gallagher nodding when his fighter was asked if the rib was broken. Linares could now face WBC lightweight champion, American Mikey Garcia, while the IBF belt in the division is held by fellow American Robert Easter and Manchester's Terry Flanagan holds the WBO crown. "I'm going to have a break with my family now," added Crolla. "I feel like I'm improving in camps still. I believe there will be plenty of options and fights out there for us and I still want to be involved in those big fights. I think I've had a pretty tough two years." 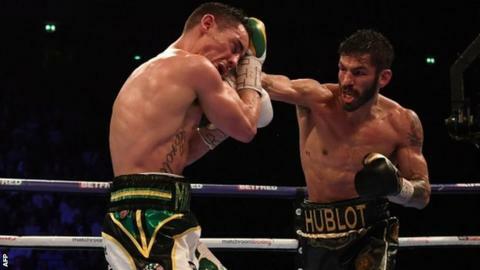 Read more on Anthony Crolla v Jorge Linares: Manchester fighter seeking "highlight of my career"